If you wanted to know what life was really like in the Cold War Soviet Union, you might take the word of an émigré Russian writer. You might even take the word of Ayn Rand, as the House Un-American Activities Committee (HUAC) did during the Red Scare, though Rand had not lived in her native country since 1926. Nonetheless, as you can see above, she testified with confidence about the daily lives of post-war Soviet citizens. Rand also testified, with equal confidence, about the nefarious influence of Communist writers and directors in her adopted home of Hollywood, where she had more recent experience working in the film industry. The purpose of the Communists in Hollywood is not the production of political movies openly advocating Communism. Their purpose is to corrupt non-political movies — by introducing small, casual bits of propaganda into innocent stories and to make people absorb the basic principles of Collectivism by indirection and implication. Few people would take Communism straight, but a constant stream of hints, lines, touches and suggestions battering the public from the screen will act like drops of water that split a rock if continued long enough. The rock that they are trying to split is Americanism. Rand and her associates helped design a “film regime” that dissected other post-war movies like William Wyler’s The Best Years of Our Lives and George Cukor’s Keeper of the Flame. These McCarthy-era film critics sought to root out "ideological termites" in the industry; they were especially distrustful of movies that elevated what Rand called, with contempt, "the little man.” One of the films identified as particularly pernicious to the “rock” of Americanism was Frank Capra’s classic It’s a Wonderful Life, a movie that today seems built on bedrock U.S. nationalist values—commitment to family, redemption through faith, contentment with modest small-town living…. We live in odd times, such that this rhetoric—which seemed so quaint just a couple short decades or so ago—sounds jarringly contemporary again as the politics of the mid-20th century reappear everywhere. The charges against the seemingly innocuous Capra film hinged in part on the alleged Communist ties of its principle screenwriters, Francis Goodrich and Albert Hackett. In their report, part of which you can see above, the FBI wrote that the screen writers “practically lived with known Communists and were observed eating luncheon daily with such Communists as Lester Cole, screen writer, and Earl Robinson.” Palling around, as it were. In addition to naming the writers’ acquaintances and lunch buddies, the report quotes a redacted individual who “stated that, in his opinion, this picture deliberately maligned the upper class.” Another blacked-out source “stated in substance that the film represented a rather obvious attempt to discredit bankers by casting Lionel Barrymore as a ‘scrooge-type’ so that he would be the most hated man in the picture. This, according to these sources, is a common trick used by Communists.” Finally, a third redacted source compares the plot of Capra’s movie with that of a Russian film called The Letter, screened in the U.S. fifteen years earlier. We cannot say for certain, but it’s reasonable to assume that many of these hidden FBI sources were associates of Rand. In any case, Rand—in vogue after the success of her novel The Fountainhead—appeared before HUAC and re-iterated many of the general claims made in the report. During her testimony, she focused on a 1944 film called Song of Russia (you can hear her mention it briefly in the short clip at the top). She chiefly critiques the film for its idealized portrait of life in the Soviet Union, hence her enumeration of the many evils of actual life there. As Raw Story notes, testimony from others at the HUAC hearings brought “redemption of an odd sort” for Capra’s movie, which “has been more than redeemed as it slowly became a sentimental and beloved holiday perennial.” But even if It’s A Wonderful Life may now look like apple pie on celluloid, Flavorwire points out that it's still liable to raise suspicions among certain aggressive pundits and culture warriors who push a “war on Christmas” narrative and see socialist subversion even in acts of charity, like those displayed so extravagantly in the film's mushy ending (above). 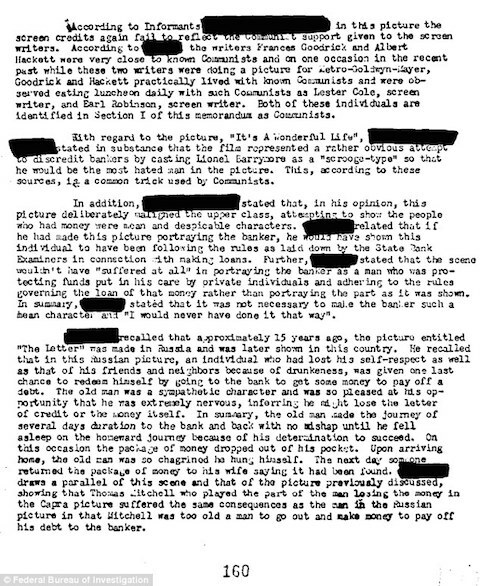 Read much more about the HUAC investigation of Hollywood at Aphelis, who include links to a redacted version of the FBI “Communist Infiltration” report and many other fascinating documents. Ayn Rand was a con artist on so many levels it’s hard to believe that anyone would take her word for anything. She was an illegal alien in the US. She was more than eager to take her Social Security from the government despite her juvenile “philosophy” in “Atlas Shrugged”. She was a joke. However, Ayn Rand was an atheist and on that I can agree with her, but only on that. Oddly the truly subversive films noir of the period that explored the flip-side of “Americanism” were left largely alone. It is definitely a bit of a stretch to consider “It’s a Wonderful Life” commie propaganda, though the economic premise of the movie is very silly. Bankers don’t get rich by denying people loans; they get rich by making loans to people who can pay them back. Love the movie, though! But Rand was right on target with “Song of Russia.” OMG – the most jaw-dropping example of commie agit-prop I’ve ever seen. Quibbles: Rand was not an illegal alien, nor did she worry much about those who were (she took it as a given that everyone wanted to come to the USA). And she didn’t “take Social Security from the government” – rather, she accepted the $ she had paid in over the years as her money. And she encouraged others to do so, although she thought a more “moral” system would be one that was non-coercive, i.e., through private investment. And it’s not a coincidence bankers are made the villain so often. What was true in Capra’s day is just as true today. As a Brit though, I do find McCarthyism incredible, and how the stigma and misuse of the word “commie” when people talk about fairer distribution of taxes is bandied about. Politics needs to be taught in schools in an impartial manner. 13,500 pages? That’s a dead giveaway that Rand wrote it. I haven’t seen anyone bring up the point that Jimmy Stewart’s lead character is also a “banker.” He operates the savings & loan in the town that gives mortgages to the townfolk in return for their deposits. He is the “good” banker; instead of using the wealth of the town for profiteering and squeezing the wealth out of the residents as Barrymore’s “bad” banker does, he represents reinvestment in the town and the people. His stirring scene where he explains this to the folks who he dissuades from a run on the savings & loan makes this type of capitalism very clear–a bank invests in the town, just as the people invest in the bank. I’m not sure why this type of capitalism was odious to Rand, other than it encourages a belief in the common good, and Rand apparently had no store in the common good. She creates her heroes and their ideals, and then leaves it at that; we should all appreciate these geniuses and their profits from their good work. It doesn’t matter that the benefits to us seem to be pretty ethereal. Rand’s commerce, art, architecture and wealth are pretty much goods for their own sake. Solid analysis of a decent, humanistic film that has a heart. Some people in that era and mindset couldn’t deal with something that was a soft value like ‘heart’. Still see that today. Being a foreigner probably didn’t offer her much to identity with as she came into contact with the common folk. Today with the media pumping ‘the message’ to everyone these kinds of self-centered cultural icons have a harder time arising . Almost the opposite where any and all have their 15 fame. Irony…when this film fizzled at the box office, it resulted in the demise of Capra’s Liberty Films–and with the slow decline of his professional reputation in subsequent years, Capra grew bitter, unhappy, and conservative. Curious. Zealous anti-communist hysteria in the 1940’s and 1950’s propels many of its victims into permanent popularity after the scare. How many pages? Was it written in really big writing, in crayon? Ya gotta agree all the Hollywood movies are against capitalism. So many movie plots are about Big, Bad, Corporations trying to buy out the last neighborhood grocery store or apartment building to tear it down and put up a high-rise or parking lot. Really, what movie can you name that said Capitalism is good? Sure. Years from now, American families will gather on Christmas eve to watch Alex Jones and Sean Hannity broadcast their heartwarming Yuletide messages of love and tolerance. Reminds me of the anti-Russian ‘anyone who supports social media is a Russian stooge’ campaign being run by the WaPo and the NYT at the moment, actually..
not to mention Trumpian spying on journalists and removing all mentions of global climate change, etc. Bet you guys thought the HUAC was just a momentary aberration, a road bump on the way to a kinder, fairer Capitalism, didn’t you? Joe McCarthy was not involved in the hearings in any way, shape or form. Senators do not chair hearings held by the House. Ayn spoke to HUAC in 1947. Joe began his hearings in 1952. Ayn Rand criticized Joe (more on that in a bit) and condemned him after he accused a General, whose name is still classified, overseeing Europe after World War 2. William F. Buckley condemned him to after that incident. But I know something they didn’t know, nor could they have known. And soon, dear reader, you will too. I began my investigation of Joe years ago with a question no one had ever asked. Where did Joe get his list from? That led me to the discovery that he had TWO lists of names, one the public was never told about. Everyone on the second list was arrested, that was KGB agents in the CIA. Anyone who tells you about the era but has no idea there were two lists has no idea what they are talking about. In 2001, in a barn outside Langley, Virginia a family was examining a barn adjacent to the house they bought when workmen told them they had found a false wall. Behind the wall were boxes sealed that were marked THE POND and CIA. They called CIA who sent agents out to get the boxes. But no one in CIA had ever heard of The Pond. It turns out, this private agency was in charge of finding reds in government. they were very effective. Why? because their source was a head of the KGB. Still with me? Good. Now, let me ask you a question. Have you ever wondered why FDR and Truman bombed every railroad track in Germany- except those going to the death camps? Did you ever wonder why they would not help Jews escape from the nazis? Did you ever wonder why we didn’t bomb the gas chambers in the camps? Did you ever ask why, since there was no military near the camps, we didn’t just bomb the walls of the death camps? Because they backed the holocaust. Truman was a klansman, says so in his autobiography. Do you have any idea what that meant in the 1940’s? For one year Japan tried to surrender. All they asked was that they keep their emperor. We dropped 2 atomic bombs on them and Truman then said, you can keep your emperor. I call that a war crime. Has Trump done anything like that? Before you read any further, I suggest you drop the mock outrage and smugness. The Pond gave Joe the list of KGB agents in the CIA. John Grombach, the man in charge of The Pond had given the list to Dulles head of CIA but incompetent Dulles had done nothing about it. Joe told him he was going to question the FBI, then CIA and then the White House for inaction on communist spies. But there was something neither Joe nor the Pond knew. Truman brought in about 200 German Intel agents who had been in charge of the holocaust. He gave them fake passports, money and many jobs. Jobs in CIA. They would be shipped off to West Germany to set up Intel there, one of their first actions was to return art that had been taken by nazis from Jews then recovered by the allies, back to the nazis for cheap. They also cleaned up government officials records so nazis could become the government again. That would have been an international crime and fodder for Russian propaganda for years to come. They could not risk Joe discovering the true face of the Democratic Party. So James Angleton made a fake dossier with fake Pond seals, accusing a general in charge of Europe after the war od being a red. Right before the Army hearings. It worked. Joe was shook up, everyone deserted him. CIA asset Edward R. Murrow attacked him. No one would discover Truman protected the men in charge of the holocaust. Then the FBI and CIA let Michael Straight of THE NEW REPUBLIC create all the lies we now know about Joe. Search MICHAEL STRAIGHT Wikipedia. You will discover that after he became a KGB asset, he became FDR’s speechwriter. After a stint in the State Department, he took over the National Endowment of the Arts where he funded art that anti- McCarthy. He funded and helped edit POINT OF ORDER a famous anti-Joe propaganda film. All the lies about Joe, can be traced to him. The FBI and CIA by allowing the reds to write the history let them into out media, our academic world long before they developed other attacks on us: Pizzagate, 911 was an inside job, AIDS was created in a military lab, JFK was killed by CIA the list goes on and on. Russia has played many of you for fools. The first critic of Russia killed on foreign soil was Trotsky. There have been many more since. I got to read the Pond/ CIA files in 2004. They are now online, just search THE POND STUDIES IN INTELLIGENCE. You will find a full confession by CIA about the fake dossier, and you will discover the story isn’t really even about Joe. It’s about The Pond. Conspiracy theory? Not if its on the CIA website grasshopper. There is no reason to keep spreading Russian propaganda on Joe. You are now, deprogrammed. “Randian apologists have argued that there is no hypocrisy in taking back the money one once had to give up in taxation — and up to a point, they have something like an argument. Unfortunately what little they have quickly falls apart. First, if her accepting government assistance really was principled and completely consistent with her philosophy, why was it apparently concealed? It should have been well known already as a demonstration that despite having money “stolen” in taxes, she was still able to get it back in the end. Why apply for the assistance under a name that would keep the information quiet? Liberals criticize Ayn Rand for this but are willing to believe the nonsense about Trump and the Russians, go figure. I have never seen Rand refer to “the little man” with contempt, or anything close to ir. In addition, it would not be consistent with her principles or philosophy. Her beef was not rich vs poor but productive/moral vs parasite/immoral. Where did you get that idea? Could you quote your source? This article is communist propaganda. Rand and Cooper were right and she was discussing “The Song of Russia” which was pure communist propaganda which portrayed the Soviet Union, which was a sewer at the time, as a modern industrial society with professionally dressed people leading normal lives as if they were living in the USA. It was a clear propaganda film which sought to deceive the American public about the mass poverty of the Soviet Union at the time. Although Rand had been away from the Soviet Union for some time, she was fully aware of what was going on in the Soviet Union during the hearings. Lots of other people were as well. This article is an effort to smear Rand and other anti-communists who were critical of the Hollywood writers who were, in fact, spewing communist lies.